OFFSIDE: Harry Kane has it in the net, but he's well beyond the Arsenal backline. Eriksen had led a counter, before passing to Chadli. The Belgian gave it back to Eriksen on the edge of the box - his low drive was well saved by Ospina. Kane tucked in the rebound first time, but the drought continues. 53 mins: Once more Debuchy is caught way out of position, this time in the centre of midfield for some reason. Rose breaks down the left and Chambers has to concede for a corner. 54 mins: The set-piece is given to Townsend on the edge of the area but Ospina is right behind the curling effort. At the Bescot Kenedy has a first Chelsea goal to make it 3-1, whilst Frazier Campbell has scored the opener for Palace. GOAL (56 mins): Calum Chambers turns the ball into his own net, sticking out a leg to turn in Nacer Chadli's low cross at the near post. 60 mins: And now Arsenal respond, with the excellent Oxlade-Chamberlain at the heart of it. He skips infield and his reverse pass to Gibbs wins the Gunners a corner. And so we must hope again... Hope that Oxlade-Chamberlain will come up with some miracle... Can't hope on anyone else personally. Omg alex oxlade chamberlain is such a beast! 65 mins: Wenger has Alexis Sanchez warming up on the touchline. But Pochettino has a neutral's favourite to call on too, and Heung-min Son looks to be on the way in. 66 mins: Even when he gets it right Harry Kane can't get a goal. A Townsend corner to the back post is behind the striker, who connects perfectly with an acrobatic bicycle kick. It beats Ospina but Gibbs just, just keeps it from crossing the line. Townsend makes way for Son. Joel Campbell makes way for Sanchez. Two mighty impressive subs there. 69 mins: A smart through-ball from Ramsey finds Alexis powering down the left. He cuts back onto his right foot to shoot, but the effort tamely rolls through Trippier legs and into Vorm's hands. 71 mins: Ramsey again pulls the strings, slipping a ball behind Spurs' backline that's right on to the striker's left foot. The struggling striker fires the shot straight at Vorm's legs. 73 mins: Harry Kane wins a corner as he breaks down the left, but takes a huge hit from the advertising hoardings (well pedantically he hit it rather than...y'know) but he walks it off. Clearly that moment of excitement affected Ospina, who nearly drops the ball into his own net. He picks it up at the second time of asking. 75 mins: Nacer Chadli makes way for Delle Alli. Time for the youngster to shine again? GOAL (78 mins): That's fantastic from Mathieu Flamini, who hits a low volley as a spiralling deflection comes into his path. He's showing Ozil how it's done. 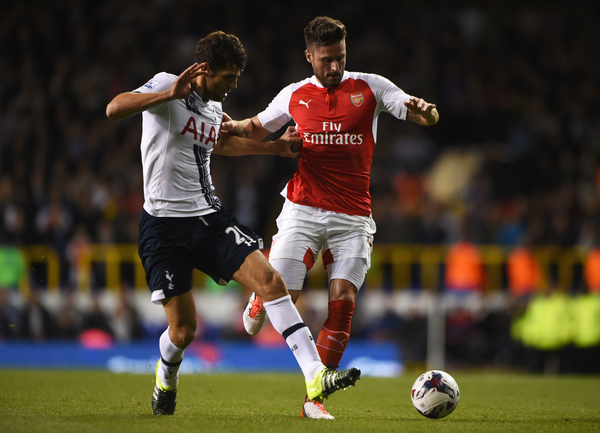 83 mins: Spurs are pressing forward but all that is doing is leaving space for Arsenal on the counter. Ramsey and Oxlade-Chamberlain nearly make him pay, the former passing to his team-mate on the right. The Ox's shot is just wide. 87 mins: Substitute Clinton N'Jie picks up the ball on the left flank and cuts in towards goal. Credit to Debuchy, who has improved in the second period, for a smart tackle as the forward came into the area. 90 mins: This just isn't going Tottenham's way, they can't quite craft a chance with three minutes left on the clock. 92 mins: Tottenham have a free-kick just inside the Arsenal half, ready for a long ball. 93 mins: It's cleared, just, and Arsenal repel several more parries. They then break, with Walcott driving wide as the clock ticks towards full time. We're fast approaching the draw, but not every game is decided. It's still 1-1 between Premier League Liverpool and League Two Carlisle. If Liverpool make it past Carlisle they'll play Bournemouth. Manchester United will host Middlesborough. Arsenal's reward for victory over Spurs is a trip to Sheffield to take on Wednesday. Chelsea will take on Stoke in the final ball drawn. One of the immediate highlights of the draw has to be Manchester City vs Crystal Palace. 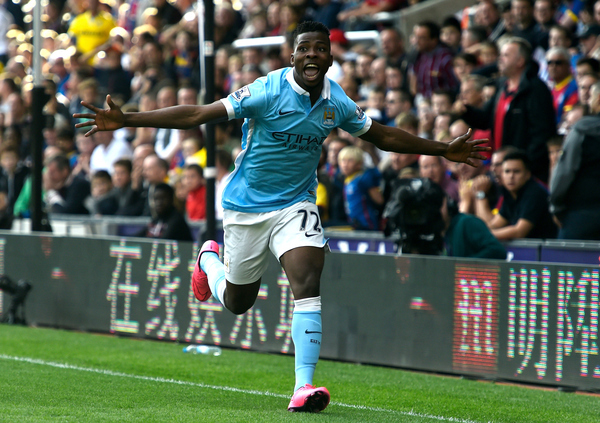 Alan Pardew's side pushed City close a few week's ago before Kelechi Iheanacho's late winner. Can they do better at the Etihad? 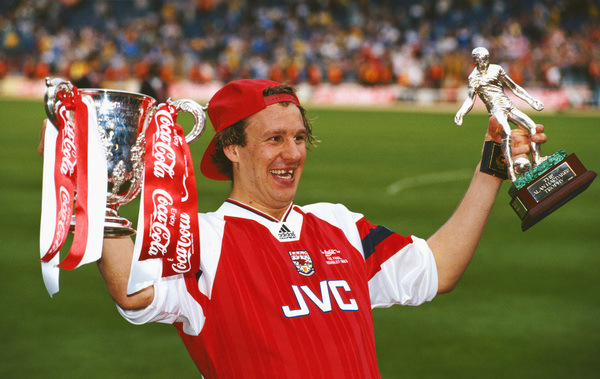 Arsenal can look forward to a repeat of the 1993 League Cup Final. The Gunners won a cup double that year, will they repeat it in 2015? And with that it's time to say goodbye. I'll leave you with the player ratings from the game. Guess who the star man was?